EA knows that Zynga staff will "have no trouble finding jobs" because it already hired several of them. It's spectacular how quickly the tables have turned on Zynga. In 2011, the casual games developer was rolling in so much money that it actually outranked Electronic Arts financially. Then the market bubble burst, and Zynga's prospects tumbled faster than a house of cards. Now the struggling company is facing legal action from Electronic Arts alongside very public attacks on its ethically-questionable industry practices. EA may not have a lot of love for Zynga right now, but the sentiment doesn't extend to Zynga's staff. According to the LA Times, EA has scooped up several former Zynga employees in the wake of mass layoffs and resignations, presumably before sticking out its tongue and taunting the former competitor mercilessly. The news came from EA Human Resources Vice President Gabrielle Toledano, who noticed a distinct increase in Zynga employees leaving resumes with the publisher. "Zynga people have good skills and experience," she explained. "They'll have no trouble finding jobs elsewhere in the game industry." While EA hasn't named specific individuals, Toledano did note that "several" applicants were hired for positions with EA. Even considering EA's strong anti-Zynga rhetoric, it's hard to blame them for the move; Zynga practically invented the concept of profitable Facebook games, providing its former staff with skills that could prove very useful to EA as it expands into free-to-play markets. The truly delicious irony is that these hires are also a reversal of last year's scenario. 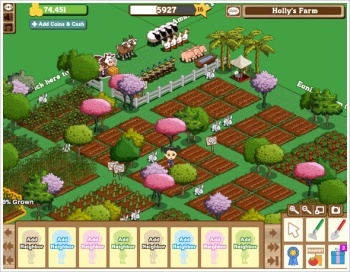 At the time, Zynga was hiring every EA executive it could get its hands on. EA seems happy to reap the benefits even as it lashes out against the company, such as when Studio President Frank Gibeau directly compared the stability of Zynga to wartorn Syria. I can't help think that since the shoe is on the other foot, it will be used to kick Zynga while it's down.